Manufactured and marketed by Intuitive Surgical, Inc., the da Vinci Surgical System (da Vinci robot) is a robotic surgery platform that is increasingly being used in a wide array of minimally-invasive procedures, including prostatectomies, hysterectomies, gall bladder removals, heart surgeries and thyroid procedures. Intuitive and other proponents of robotic surgery claim that the use of the da Vinci surgical robot can result in quicker recoveries and less bleeding than conventional open and laparoscopic procedures. In recent years, however, the da Vinci robot has come under increasing scrutiny, as some studies have raised questions about the costs and benefits of robot surgery versus traditional laparoscopy. At the same time, an apparent rise in adverse event reports related to the da Vinci robot has raised concerns about its potential risks. What is the da Vinci Robot? Brought to market in 2000, the da Vinci surgical robot allows a surgeon to operate remotely from a console while viewing a virtual 3D image of the surgical field. The doctor operates by manipulating joystick-like levers and pedals that control instruments and a small camera positioned inside a patient’s body. According to Intuitive Surgical’s marketing materials, robot surgery provides “greater surgical precision, increased range of motion, improved dexterity, enhanced visualization and improved access” compared to more traditional methods. Since its initial launch in 2000, robotic surgery procedures performed via the da Vinci have grown extensively. According to one report from Bloomberg.com, the da Vinci surgery robot was used in more than 350,000 procedures in 2012. The technology has been purchased by more than 1,300 hospitals in the U.S.
As use of the da Vinci robot has grown, so has criticism of robotic surgery. According to a report published by The Wall Street Journal in February 2013, no large, randomized, controlled studies have shown that robot surgery patients do better than those who undergo other types of minimally invasive procedures. 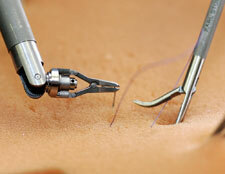 However, some studies have suggested that robotic surgeries are more expensive than laparoscopy. For example, research published in the Journal of the American Medical Association (JAMA) reported that the costs for robotic hysterectomy totaled nearly $9,000, versus about $3,000 for the least expensive method. The authors of the study were also unable to conclude that robot surgery offered patients any additional benefits over traditional laparoscopy. There has also been criticism of the way robotic surgery has been marketed by hospitals. For instance, a study published in the Journal of Health Care Quality in May 2011 found that many hospital websites touting robot procedures overestimate its benefits and ignore its potential risks. The same study also found the information provided by hospitals is greatly influenced by the manufacturer of the technology. In November 2013, Bloomberg.com reported that adverse events logged by the U.S. Food & Drug Administration (FDA) involving the da Vinci surgical robot had more than doubled over the course of the year. According to the article, the agency had received 3,697 reports related to the da Vinci surgical robot through November 3, 2013. In 2012, it tallied 1,595 such reports. For its part, Intuitive Surgical maintains that actual adverse events related to the device remain low, and attributed the apparent increase to a number of issues, including rising use of the da Vinci robot and growing litigation surrounding the device. In October 2013, Intuitive Surgical disclosed in a regulatory filing that it had been named in at least 50 product liability claims alleging injury due to the da Vinci surgical robot. According to the company, some of these lawsuits alleged that patient injuries were the result of defects in the device, and/or issues with the methods the company employed to train physicians to use the technology. Many recalls have taken place.